The Community Development and Knowledge Management for the Satoyama Initiative Programme (COMDEKS) was launched in 2011 to support local community activities that maintain and rebuild target production landscapes and seascapes, and to collect and disseminate knowledge and experiences from successful on-the-ground actions so that, if feasible, they can be adapted by other communities throughout the world to their specific conditions. The programme provides small-scale finance to local community organizations in developing countries to support sound biodiversity and ecosystem management as well as to develop or strengthen sustainable livelihood activities planned and executed by community members themselves. 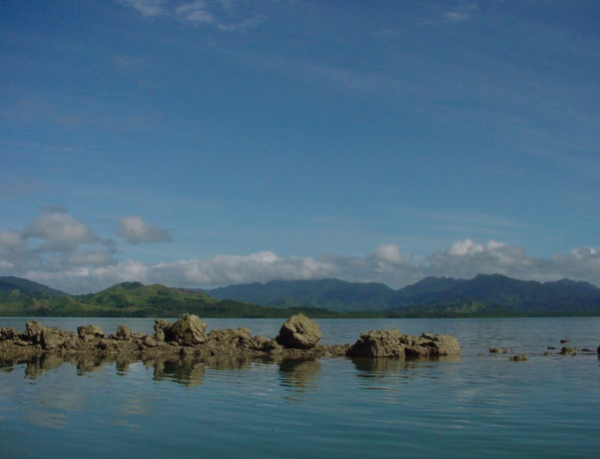 The target landscape for COMDEKS activities in Fiji is the Natewa-Tunuloa Peninsula, located on the island of Vanua Levu, one of the two largest islands in the Fiji archipelago. 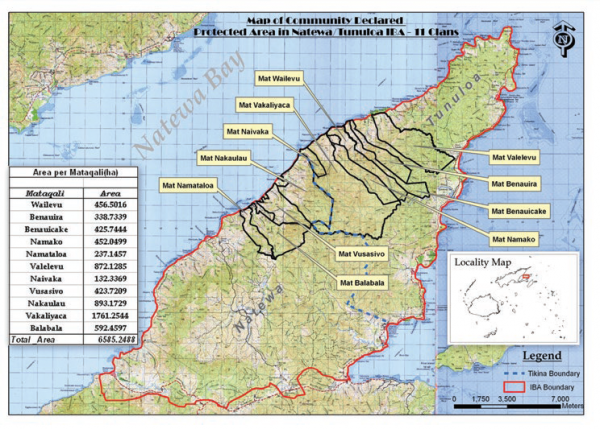 The target landscape for COMDEKS activities in Fiji is the Natewa-Tunuloa Peninsula, covering an area of about 25,000 hectares. It is located on the island of Vanua Levu, one of the two largest islands in the Fiji archipelago. The landscape lies in the southeastern section of the island and borders the southern coastline of Natewa Bay, the longest bay in the South Pacific. The priority landscape encompasses the two districts of Natewa and Tunuloa. Both districts are part of Cakaudrove Province, one of the fourteen provinces making up Fiji, and fall under the country’s northern division of administration. The target landscape remains largely undeveloped, the closest urban locality being the township of Savusavu, 60 km to the southwest. The 16 villages within the area are spread out along the coastal periphery of the peninsula; inland areas are mostly devoid of settlement. The Natewa-Tunuloa Peninsula is located on the wetter, windward side of Vanua Levu, and receives 2000-3200 mm of rainfall annually; the annual temperature range in the area is 19.6°C- 29.3°C. The drier, cooler months last from May to October and the warmer, wetter months last from November to April, during which cyclones and tropical depressions usually occur. The volcanic soils are well drained and not prone to waterlogging in normal rainfall years. However, they tend to be low in nitrogen, phosphorus, and potassium. The Natewa-Tunuloa Peninsula was chosen as the target landscape for the COMDEKS project firstly due to the status of the landscape’s terrestrial and marine environments as national and global biodiversity hotspots. Secondly, COMDEKS’ strategy to address poverty and provide viable income options for communities within the landscape aligns well with Fiji’s national development policies. 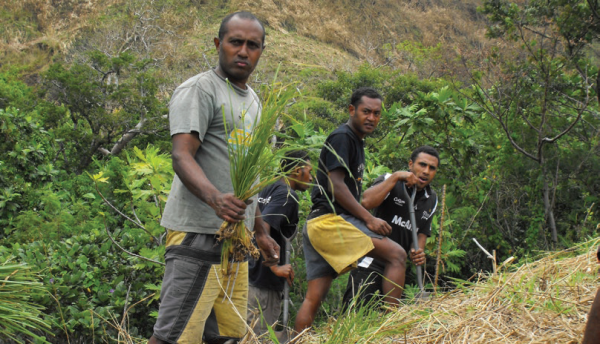 The region presently lacks the diversity of organizations and community projects prevalent in other rural areas in Fiji, and it is hoped that COMDEKS activities will raise the area’s profile, improve its social infrastructure, and increase investment in sustainable enterprises. Thirdly, this landscape provides an opportunity to document and revive traditional practices, and to meld local knowledge with modern concepts and technology to revitalize the landscape and its communities. Within the target landscape, the combination of climate and topography provides for a variety of natural terrestrial habitats and ecosystems, from littoral coastal shrub-land and mangroves, to low and montane forests. The estimated forest cover area for the landscape is 70 percent, of which roughly half is old growth lowland and montane forest. The other half of the forested area consists of scattered remnant multiple-use forest and timber plantation forest. The remaining 30 percent of the landscape that is not forested includes coconut plantations, community agricultural areas, and grasslands. Industry within the landscape is almost non-existent, the major activities still being agriculture-based, with limited opportunities for non-farm employment. From the 1950s until the last decade, the area was a major timber-producing area, both from native forests and pine plantations. Likewise, copra played a major economic role in the area for many decades until the industry’s eventual decline. Presently the major source of revenue for communities is the cultivation of dalo (Colocasia esculenta) and yaqona (Piper methysticum). Copra is also still harvested as a cash crop and honey has recently appeared as a lucrative source of income for the area. However, in general, much of what is cultivated in the area is for subsistence consumption. 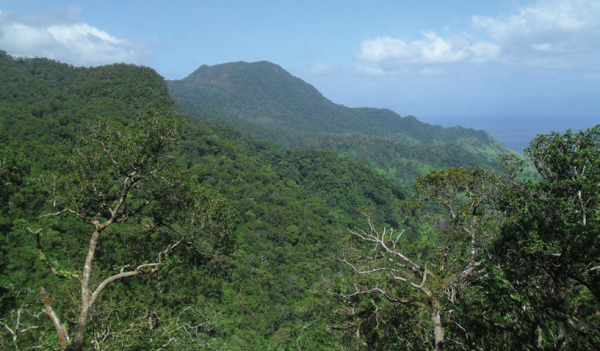 The landscape has been listed as a site of national significance under the Fiji National Biodiversity Action Plan and prioritized for conservation since it is one of the last places in Fiji, which retains forest with an intact range from lowland to montane habitats. Due to the intact forest, the area retains very high bird diversity, of which 21 of the 28 species present are endemic to Fiji. This includes the landscape’s flagship species, the threatened Vanua Levu subspecies of Silktail (Lamprolia v.kleinschmidti), whose habitat is confined to the Peninsula. The forest is also known to support unique ground-dwelling species such as endemic terrestrial mollusks and cicadas. The freshwater systems too are noted for biodiversity, including a high diversity of freshwater fishes, such as endemic gobies. The population of the Natewa and Tunuloa districts is 3,428 (1,753 male, 1,675 female), and the area has a relatively low population density of 13.6 persons/km”. Indigenous Fijians make up 97.8 percent of the local population, with Fijians of Indian descent (0.4) and Fijians of other ethnicities (1.8) making up the remainder. Households are largely multi-generational, with three or four generations residing together. In terms of landscape demographics, the population is primarily agrarian, predominately indigenous, and contained within 16 traditional rural village settlements. Each village is led by a traditional village chief, who heads a collective number of clans (mataqali). These village chiefs are then consolidated under a traditional government unit called the vanua, in which an overall district or high chief presides. This traditional system is still very active in decision-making processes during village and district meetings regarding the welfare and development of communities in the landscape. In terms of governance at the state level, both districts officially fall under the administration of the Cakaudrove Provincial Office, the official implementing arm of government. The provincial office maintains and coordinates elected headmen in each of the villages, who are responsible for implementing, monitoring and reporting defined community activities, such as the collection of provincial levies or community projects. Road, power and water infrastructure are somewhat marginal within the area. Although most villages are connected by a road system, it is unpaved and in some sections severely degraded; three of the villages fall outside of this road network. Access to electricity is quite limited, with many village generators having fallen into disrepair. However, some villages have installed microhydro dams or solar power. Most village dwellings receive piped water from communal reservoirs. Recently, water quality issues have arisen due to contamination of water sources and a general decline in health and hygiene practices. The incidence of poverty in the area is high, with 62 percent of the total population of the two districts falling below the poverty line, according to a 2009 survey. The high poverty incidence and limited employment and income opportunities have translated into other social ills, such as illegal marijuana cultivation. The general lack of economic opportunity coupled with the poor social infrastructure is a contributing cause for the general underdevelopment of the landscape. Deforestation and the loss of native old growth forest is one of the primary environmental threats in the target landscape. One of the root causes for this has been commercial logging of the indigenous forest since the 1950s, and the replacement of these former lowland forests with timber plantations of pine and mahogany, as well as the continuance of logging activities in an unsustainable manner. An additional contributing factor is the continued reliance on wood as a home cooking fuel; some 90 percent of households still cook on wood fires. The second major threat comes from accelerated cycles of shifting cultivation, where farmers encroach on existing forest to create new agricultural plots when the fertility of their old plots declines. Formerly, they would return to their original farm plots when vegetation returned and soil fertility improved. But acceleration of the cycle has left insufficient time for revegetation to occur fully before cultivation starts again, resulting in an overall loss of soil fertility, compromised water quality, and sedimentation of low-lying and coastal areas. These effects, in turn, threaten local food security, both directly, through soil loss and declining yields, and indirectly, through disruption of marine ecosystems by sediment overload, and the consequent decline in coastal fisheries. One underlying cause for these landscape threats is the lack of a concerted and coordinated effort by both the communities themselves and the local government with regard to natural resource planning and management, and building a general awareness on environmental issues. But just as important is the general lack of income opportunities and social infrastructure. Unless these are improved in tandem with greater environmental awareness and improved production techniques, communities will likely continue to perpetuate unsustainable practices. In order to set the stage for the landscape baseline assessment, Birdlife International-Fiji (BIF), the NGO selected to conduct the baseline assessment, carried out a preliminary scoping assessment of the target area in February 2013. They visited key stakeholders—including government representatives, NGOs and communities members—in all 16 villages within the two districts of Natewa and Tunuloa to collate the relevant information that would contribute to a more comprehensive baseline assessment of the landscape. Stakeholders met to discuss landscape threats, active community projects and priorities, governance structures, and critical issues for the development of a landscape strategy to enhance the socio-ecological resilience of the target landscape. With this community consultation as a basis, 46 participants were selected to attend the baseline assessment workshop in Natewa Village, at which they scored the resilience indicator set developed by Bioversity International and the United Nations University. The workshop was conducted in the local language. Key stakeholders were identified from various agencies, civil society organizations and community representatives in the target area. Two persons from each of the 16 villages were nominated by the Provincial Office to participate in the assessment based on community standing and influence. Community members in attendance included community elders and leaders, youth representatives, women leaders, and local community members with a sound knowledge of the landscape (such as farmers and community conservation monitors). Of the 46 participants, 18 were women. In addition to those chosen to participate in the indicator scoring exercise, 30 other community members attended as observers simply because they wished to be part of the process. During the scoring exercise, participants were broken into three groups, one group comprising the government and NGO representatives, and the remaining two groups containing community representatives from each of the two districts. Maps for the baseline assessment were derived from community mapping exercises conducted earlier by Birdlife International-Fiji. The indicator scoring results were collected and analyzed by district groupings and as a consolidated group. Participants were then asked to discuss and identify ideal community activities that could improve landscape resilience in successive years and contribute to the long-term sustainability of their landscape. 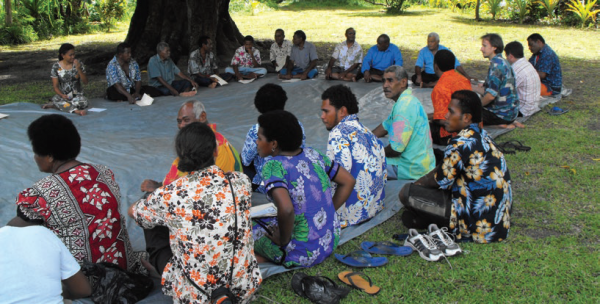 The baseline assessment and community consultation gave rise to the COMDEKS Country Programme Landscape Strategy for Fiji, which describes the landscape, sets out the findings of the baseline assessment, lists local threats and opportunities, and sets out a slate of four landscape outcomes and associated indicators to measure progress toward these outcomes. The strategy also sets out the selection criteria to be used to choose local projects to attain the landscape outcomes. Table F-1 shows the four Landscape Outcomes around which the strategy is built, as well as the performance indicators that will be used to measure these outcomes. Outcome 1:Critical ecosystems and habitats within the landscape are protected, restored, or effectively placed under an acceptable and recognized sustainable natural resource management regime. · Area of critical ecosystems brought under community protection or another form of sustainable management.· Area of degraded ecosystems restored or rehabilitated. · Number of studies documenting natural assets present within the landscape. · Area of existing and former plantation forest brought under a replanting program and a sustainable forest management regime. Outcome 2:Agricultural biodiversity and productivity within the landscape is maintained and enhanced through sustainable land use practices and approaches. · Area of agricultural land brought under a sustainable land use management regime.· Number of community farmers actively taking up and practicing sustainable land use management and demonstrating productivity. · Number of communities establishing viable seed banks for enhancing crop diversification. · Number of community farmers actively reviving sustainable traditional farming methods and retention of traditional breeds of local crops. Outcome 3:Local livelihoods sensitive to maintaining landscape natural assets within a sustainable exploitation context are enhanced, improved, and replicated through community-driven income generation and development initiatives. · Number of markets established and actively accessed by community households as part of livelihood initiatives. Outcome 4:Institutional and local community capacity strengthened to enhance participatory planning on conservation and sustainable production issues affecting landscape resilience. · Number of local community-based institutions established or strengthened to actively apply integrated landscape management.· Number of strategic partnerships formed or networks established to up-scale community-based efforts and initiatives. · Number of best practices and lessons learned that have been captured at the local, national and international level. · Number and type of policies influenced at the local, landscape, and national levels. Demonstrate effective protection of existing natural biodiversity within the landscape and rehabilitate degraded areas to restore ecosystem connectivity, services, and function (e.g. restoration of buffer strips, natural vegetation near community water sources). Demonstrate an improvement in and the promotion of sustainable agricultural practices within the landscape (organic farming, model farming, agroforestry, etc.). Integrate local knowledge and modern tested approaches and innovations that will protect local crop diversity, promote cultural practices, and contribute to livelihoods improvement (e.g. traditional taro irrigation system, traditional mulberry cloth production, etc.). Enhance a multi-faceted approach in achieving COMDEKS outcomes, for example designing agricultural activities that promote agricultural crop diversity, local food security and improve income potential for communities. Utilize research and planning in project design that directly lead to building knowledge regarding the landscape and achieving a conservation target in tandem with improving local socio-economies (e.g. supporting District Planning and addressing development needs with reference to natural resource management, Land Use Planning and improving utilization of land as part of a landscape production approach). Strengthen local capacities for self-management and long-term sustainability (e.g. trainings, meetings to strengthen local networks and improve stakeholder planning, and partner collaboration, etc.). Are complimentary in design and with the potential to secure external funding outside COMDEKS, especially development components which may go beyond its objectives and financing capacity (e.g. drainage project to improve community health, ice plant, or processing plant as part of livelihoods enhancement). With this guidance in mind, five projects have been selected as part of the COMDEKS Fiji Country Strategy portfolio of local landscape interventions in the target landscape of the Natewa-Tunuloa Peninsula (see Table F-2). Two are landscape-wide support projects meant to provide initial capacity building and information to allow communities to successfully plan and implement their own local projects. US$45,000 Outcome 4 (Meant to precede other projects.) Designed to prepare communities so that they can propose, plan, and implement COMDEKS projects that can realize the outcomes in the Landscape Strategy. In addition to providing community members technical help and capacity support in project planning, the project will also create a village-level structure of committees to make sure that communities can effectively govern their landscapes. It will also work to establish a good link with the District government, which is a key partner in implementing the COMDEKS local projects. US$45,000 Outcomes 1, 2, 3, 4 Designed to support local projects by providing a complete land use and biophysical survey of the target area. A second aspect of the project is a targeted awareness program to inform community members about the need for and benefits of landscape level management. A third aspect deals with building the capacities of women in the landscape so that they can actively participate in COMDEKS projects. US$40,000 Outcome 1, 2, 3 In this multifaceted project, the community will recondition a former nursery, turning it into a seed bank and producer of agricultural crop and tree seedlings to be used to bring abandoned land back into useful production. The nursery will also produce tree seedlings for forest replanting. Demonstration farms will also be established for dalo and masi production. A final aspect of the project will be training in bee-keeping and honey box construction. US$30,000 Outcomes 2, 3 The emphasis of this project will be to increase agricultural productivity and maintain agricultural biodiversity by reviving traditional crop varieties and establishing demonstration farms. 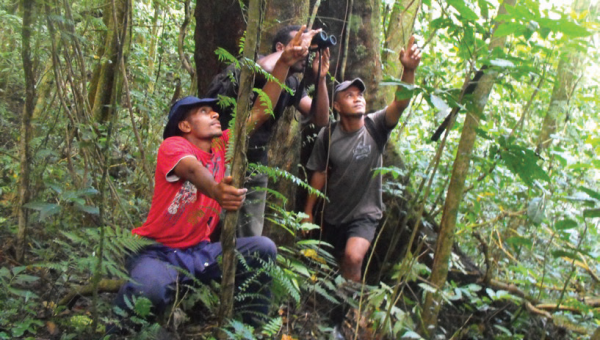 In addition to the practical effect of increasing local incomes, these activities will also help to relieve pressure on the nearby community protected area, which has come under threat from unsustainable farming and logging practices. US$30,000 Outcomes 1, 2, 3 The Natewa District School sits on a 1200-acre site–the remnants of an abandoned pine plantation now covered in grass. This project will bring this land back into sustainable production by replanting Mulberry and Calliandra trees, and also establish a nursery that will focus on indigenous species and commercially valuable trees such as sandalwood and teak. A third aspect of the project will be establishing an apiculture project to generate income for the school. Establishment of Village Forest Nursery for the Community Landscape Restoration Programme and Coastal Rehabilitation Project for the Village of Vusasivo Nacowaga Development Committee Outcome 1 Designed to rehabilitate the coast line of Vusasivo Village through the construction of a nursery to raise mangrove and native tree seedlings that will be used near the coastline as natural stabilizers for degraded or eroded areas. Mangrove will reduce sedimentation along the waterway. The project also aims to build awareness of local communities about the adverse impacts of climate change on their natural resources and ecosystems. Developing comprehensive land use maps of the target landscape: To help communities make informed decisions about how to use their forest and agricultural resources, an extensive forest and agricultural mapping exercise was conducted with the help of the state Land use, Agriculture, and Forestry Departments. This was accompanied by the training of field staff in GIS methods and forest mapping techniques. The maps included data on the types of leased forest land in the area. They gave communities and forest owners access to background information on forest boundaries and the geographic characteristics of the forest (such as slope, altitude and area covered by different forest types)—information that allowed local landowners to better plan forestry projects that were feasible and to determine the types of consultations they needed to bring them about. Obtaining these maps and sharing them with the community established the principle of genuine participation by local communities, stressing the need for their participation in the application of GIS and GPS mapping methods. Developing an institutional platform at the landscape level: An extensive participatory survey was conducted to examine and strengthen the local landscape governance framework. Survey results were used to assemble a village profile for all 16 villages in the target area. One concrete outcome of the village profiling was the establishment of Village Development Committees in each village, with the responsibility of developing a village development plan, under which all development and environment projects would fall. Simultaneously, Natural Resources and Environment Committees were also established in many villages (9 committees so far) to oversee the formulation of management action plans to help coordinate environment-related projects. Establishment of these bodies gave communities an official route to manage and “own” the COMDEKS projects within the larger framework of the landscape. At the provincial level, effort was made to make sure support services were available for local grantees. At the national level, a technical advisory group was formed to make sure the services of the Agriculture, Forestry, Land use, and other government departments were also available for support. Altogether, this set the institutional landscape so that local projects would be primed for success and be properly lodged in local institutions, with support from provincial and state institutions. Capacity building among village leaders and natural resources committee representatives:village leaders and environment/natural resources committee representatives took part in three separate consultations with technical advisory personnel from the government and other Small Grants Programme grantees with expertise in community forestry, sustainable agriculture and food security, land use planning and management. These consultations allowed a more one-on-one engagement with technical partners who would be assisting communities to implement local COMDEKS projects, but they also provided in-depth knowledge on the technical design and rationale of some potential interventions. These briefings prepared these local leaders to be a resource to their communities in organizing and carrying out local projects and engaging properly with government partners. Topic areas included: understanding forest degradation; guidelines and techniques to assess and monitor forest degradation; and background on likely interventions such as community-based plantations to replace logged areas. Mainstreaming gender into local community development and natural resource planning: A workshop on gender and climate change-a first in the province-was attended by 60 men and women from the villages in the area. The workshop raised awareness of women’s roles and contributions not just to natural resource management, but to community development initiatives in general. One of the outcomes of the workshop was the formulation of village-level action plans for gender inclusion in local development plans and projects. Rejuvenating abandoned lands for forestry and farm income: Replanting of 1000 ha of former pine plantation at the District school with commercial tree crops has begun, as well as the replanting of 500 ha of former crop lands with dalo and copra (coconut palm), bringing these lands back into sustainable productivity. Four community nurseries have been established to produce seedlings for these and other rehabilitation efforts, with another two soon to come. Since local landscape activities are still in the early implementation stages, landscape level effects have had little time to emerge, and landscape-wide networks and contacts between local community groups are still in the process of forming. However, the completion of two broadscale capacity-building and information gathering projects has laid a good foundation for bringing about landscape-wide effects. Providing landscape-wide land use maps and information on land tenure to all communities gives these separate communities a more synoptic view of conditions throughout the landscape, and makes it easier for communities to see their local projects in relation to other efforts within the Natewa-Tunuloa peninsula, reinforcing the integrated landscape approach. Accessing the information presented in the maps and having this information packaged in a user-friendly manner has allowed land and resource owners to appreciate the limitations that land and soil types can have on the interventions they make on their land. At the same time, creating an institutional structure in each village (i.e., Village Development and Natural Resources and Environment Committees) that can attend to local planning and project implementation, and yet meshes with larger-scale government planning and management efforts within the region, is a clear starting point for the development of functional governance mechanisms at the landscape level. One important expression of this is the fact that government partners have increasingly engaged with the villages committees on a range of development and infrastructure issues beyond purely environmental matters. The integrated approach to landscape development was a key factor in community acceptance of COMDEKS. One of the most powerful aspects of the baseline assessment workshop is that the indicator scoring exercise and following discussion did not just focus on biodiversity and ecosystem integrity alone, but put these physical and ecosystem elements in the context of local development and improving the community’s social well-being. In addition, it forced participants to look at the landscape more broadly, rather than focus exclusively on their own village. In the mapping exercise, most community members tended to fix on their own village, but once the scorecard exercise was undertaken, they realized that there was a bigger picture, and that any actions taken at the village level would have repercussions throughout the landscape. Overall, communities have expressed their strong appreciation for COMDEKS’ landscape approach. In Fiji, the baseline assessment acted as a platform for a productive meeting of stakeholders at three different levels: local community members, provincial officials, and national technical departments. The consultations associated with the assessment allowed these parties to critically examine the target landscape together and generate locally appropriate approaches and actions that will bring positive change to the landscape and its c One important benefit of this was that it effectively combined two useful perspectives: community involvement represented a bottom-up approach that engaged communities at a grassroots level, challenging local people to act in their own interest and determine what sustainable development means in the local context. At the same time, the substantive involvement of provincial and national officials at the top means that the local projects will not be marginalized at higher levels of government. In fact, the information generated by communities for the baseline assessment will become part of the National Strategy. With the combination of planners and decision-makers considering community input for the target landscape, the baseline assessment was able to bring all participants nearer to a common vision for protecting and managing the Natewa-Tunuloa landscape. Due to the technical nature of COMDEKS, the engagement of technical service providers, advisory groups, and other partners was critical from the onset. In Fiji, and particularly for remote rural areas such as the target landscape, the engagement of extension services from the government’s Agriculture Department, Landuse and Planning Department, and Forestry Department had to be prearranged and senior staff from these agencies had to be involved in project planning from the beginning. There is a need to better integrate traditional leadership into the overall governance of the COMDEKS project portfolio, while also respecting the important role of the provincial government in the planning and oversight of local projects. Communities need to better understand and respect the different roles of the various traditional and government administrative institutions to insure both local ownership and government participation and support. That said, the COMDEKS programme did allow for real engagement of the Provincial Office in the arena of environmental and conservation work, and also allowed for meaningful realignment of village, district, and provincial plans and objectives. The baseline assessment process in the Natewa-Tunuloa Peninsula illustrated that gender sensitivity and inclusivity is imperative for the COMDEKS initiative to meet its target goals. Decision-making and ownership of resources are inherited by men in the Natewa-Tunuloa Peninsula, but women, despite little access to resources, have proven that they can greatly improve the livelihoods of their communities. For this reason, landscape projects should include elements particularly focused on strengthening women’s capacities, leadership abilities, and helping to advance their involvement in governance and decision making processes. In the future, COMDEKS Fiji should support specific projects managed by women’s groups within the landscape. An additional entry point is to ensure that women’s participation is a criterion for community based institution strengthening, and that women are involved in any engagement with external partners and networks. Finally, it is essential that gender knowledge is captured and documented to improve the participation of women in future community programs. The success of the workshop on gender and climate change demonstrated that progress in this area can be made and that COMDEKS can be a fruitful platform for gender mainstreaming.